H10 Itaca is within 10 minutes’ walk of Sants Train Station, the AVE High-Speed Railway, Plaza España and the FIRA Exhibition Centre. It features a stylish 700 m² terrace with a plunge pool. 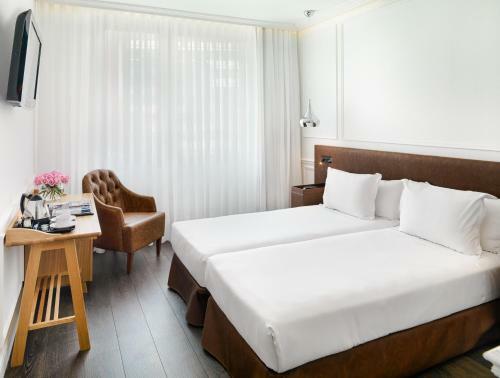 Each bright room at this modern hotel includes free Wi-Fi, a safe, a flat-screen TV, a minibar and a desk. Barcelona city centre, including Plaza Catalunya and Passeig de Gràcia, can be reached in 10 minutes by Metro, and FC Barcelona’s Camp Nou Stadium is just 2 stops away. Sants Station runs local and national rail services, including the airport train and the AVE link to central Madrid. Hotel H10 Itaca offers a free welcome glass of cava for all guests. The hotel features a smart restaurant serving signature cuisine and you can enjoy a drink in the chic lobby. The relaxing terrace features sofas and comfortable chairs set under parasols, ideal for enjoying a cocktail. The Itaca also features a fitness room and a sauna. There is a business corner open 24 hours a day. Free national and international newspapers are provided. Please note, H10 Itaca offers free access to its sauna and hot tub from 10:00 until 20:00. Please note the outdoor pool is relatively shallow. Please note the hotel's terrace is closed for refurbishment from 2nd November until 28 February. Set on the hotel's 2 upper floors, these bright, modern rooms have free Wi-Fi, and a safe suitable for a laptop and which also has a charger. There is a flat-screen TV, a desk, a minibar, a kettle, an iron and a media hub. The bathroom has a bath, a hairdryer and Textures Collection amenities. Rate: € 69.00 ... € 235.00; select dates below to get current rates. These bright, modern rooms have free Wi-Fi, and a safe suitable for a laptop and which also has a charger. There is a flat-screen TV, a desk, minibar, a Nespresso Coffee Machine and an iron. The bathroom has a bath, a hairdryer and Textures Collection amenities. Rate: € 81.00 ... € 242.33; select dates below to get current rates.